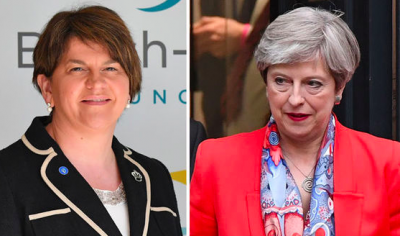 Tories Leap Into the Unpopularity Abyss – The official Conservative party spokesman, Laura Kuenssberg, has just announced that Theresa May will remain as Prime Minister, supported by the Democratic Unionist Party in Northern Ireland. Now the DUP are probably the most unpleasant bunch of individuals in organised politics in the UK. The “No Surrender” arch protestant bigot party founded by Ian Paisley. The DUP are corrupt, homophobic, racist and above all religious bigots of the worst kind. The nastiest people in politics. The utterly discredited Theresa May refuses to resign and intends to continue to rule over us with the support of this ugly faction. Popular support for the Tory government is going to plunge to unprecedented levels. This gruesome malformation of a bigots’ alliance between Brexiteers is not going to last long as a government, and the popular retribution will be massive. Craig Murray is an author, broadcaster and human rights activist. He was British Ambassador to Uzbekistan from August 2002 to October 2004. He joined the Foreign and Commonwealth Office and held various positions of seniority from London to West Africa.